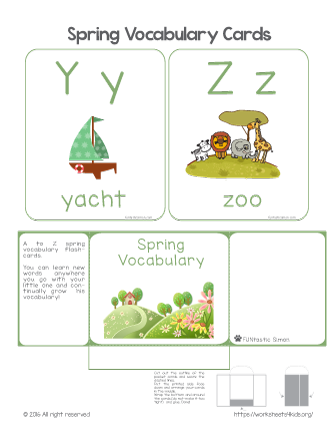 Bring colorful Spring vocabulary flash cards in your class. Flashcards help children easily remember new words. Encourage kids to describe each word they already know. Great for practicing speaking skills in class. Each card has a reference picture, the letter and the word that starts with this letter. Words: yacht and zoo.